Guitar-gods are alive and well, certainly on “The Nature Of The Beast” by IMPELLITTERI , Chris Impellitteri performs his usual brand of fret-board acrobatics across this latest long-player, he is still breathing fire across the strings and by the sounds of this album he is still enjoying himself tremendously. This the bands eleventh-studio album proves just how powerful this latest line-up is, although there has been many changes over the last thirty-years the core of the elements which put IMPELLITTERI under the ‘classic’ banner are very much intact. 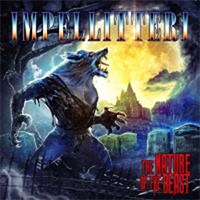 “The Nature Of The Beast” has more guitar-shredding per-square-inch than most albums released nowadays, you can feel the blisters form on your fingertips just by listening to it, however, that is not taking away from the rest of IMPELLITTERI, the voice of Rob Rock hits the octaves found in most operatic genres, the sensational drumming of Jon Dette keeps all in line while providing, along with James Pulli on bass, the perfect backdrop for Chris to show why he is one of the fastest guitarists in the world. Looking at the track listing it is not hard to pick out the two cover-versions, a trashy, sonically-accelerated take on IRON MAIDEN’s classic “Phantom Of The Opera” along with a re-model of the BLACK SABBATH classic “Symptom Of The Universe” although in the hands of IMPELLITTERI it becomes a creature reborn in this new century. The covers aside the ten-originals are excellent songs, the foot is to the floor from the opener “Hypocrisy”, loud, fast and if you own a guitar it’s already in the bin, there is a powerful standard set of virtuosity matched with melody. Thunder, lightning, a ringing church bell and a scream, all very SABBATH-inspired, until the song “Run For Your Life” detonates, an in-your-face attack of instruments as the demon is brought to life chasing you. A standout track is “Gates Of Hell”, the drumming of Jon Dette is exceptional here, the band are as solid a machine as the guitarist, this a nod of sorts to Ronnie James Dio with even Rob Rock shouting the trademark “Look Out!” at one point during the song. “Kill The Beast” with its multi-guitar layered opening crunches and fires the band on all cylinders, the production throughout the album is flawless, all musicians have been given an equal balance, Chris Impellitteri may be the star of the show but his role does not dominate proceedings. The grunge-era and Brit-pop of the mid-nineties may have extinguished the flames of many guitar-gods but this album proves they still exist, if it only comes to the surface once in a while, they are also capable of producing a work of quality tunes and melodies and not just a shredders showcase.